Sun International Ltd. plans to exit Nigeria after the South African casino and hotel operators earnings in the country plunged amid a weakening economy and a dispute involving the companys local partners. Sun International bought 49 percent of the Nigerian Stock Exchange-listed Tourist Company of Nigeria 10 years ago, giving it part-ownership of the Federal Palace hotel in Lagos, one of the main hotels used by businessmen traveling to the commercial capital. Earnings before interest, taxes, depreciation and amortization at the Nigerian operations fell 58 percent in the 12 months through June, Sun said in a statement on Monday. Occupancy rates at the property fell to 42 percent. "The Federal Palace continues to operate in a difficult environment with the Nigerian economy facing a number of crises including the low oil price, the Johannesburg-based company said in the statement. The Islamist insurgency led by the Boko Haram group and a weakening naira also hurt trading, while an ongoing shareholder dispute has frustrated all attempts to develop and improve the property, the company said. Other South African companies to have left Nigeria include retailers Woolworths Holdings Ltd. and Truworths International Ltd., citing tough regulation and rising costs. Johannesburg-based MTN Group Ltd., Africas biggest mobile-phone provider, agreed to pay a 330 billion naira ($957 million) regulatory fine in the country earlier this year, leading to its first-ever half-year loss. 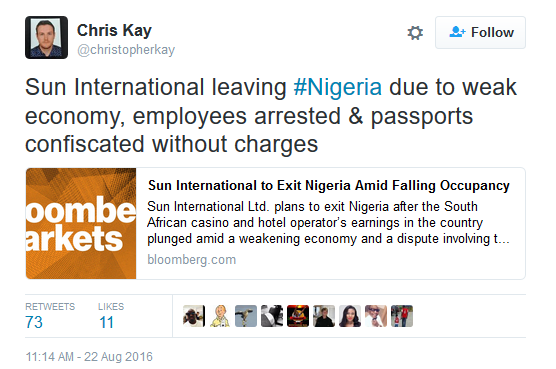 Sun has been drawn into a long-standing family dispute between fellow shareholders in Nigeria, the company said earlier this year, after workers, including South African expatriates, were detained without charges by Nigerias Economic and Financial Crime Commission. The employees have still not had their passports returned to them, while no charges have been laid against them or the company, Sun said on Monday. The process of exiting Nigeria is likely to be protracted, as Sun seeks to ensure it receives fair value for the investment, the company said. The hotelier said in May it plans to sell minority interests in properties in countries including Zambia, Botswana and Namibia for 394 million rand ($29 million) to reduce debt. The shares were 0.4 percent lower at 91.76 rand as of 2:02 p.m. in Johannesburg, valuing the company at 10 billion rand.